If you’ve ever flown, you know there are two ways of transporting your luggage. If you’re going on a short trip and don’t need to pack a lot of stuff, you can easily get by with taking a small carry-on suitcase. No need to check any luggage. You just get your boarding pass and you’re off to the gate to board your flight. The best part of this option is that when you get to your destination, you’re ready to go. You don’t have to walk to another location and wait with most of the people to claim their overstuffed suitcases. No, you simply carry what you took on the plane. It sure does save a lot of time. And it certainly keeps you from exerting more energy, caused by dragging extra weight behind you. But the majority of people don’t do this when they travel. If you’re going on a longer trip or just must have that larger suitcase to cram in all your stuff, then you have to choose the other option. You must check your luggage at the check-in station. This slows down the process quite a bit. By the time you get it all checked in, weighed and put up on the conveyor belt, the others who are not checking luggage are already sitting comfortably in the waiting area, sipping on a cup of coffee, reading a book. Oh, and did you know if your suitcase is over a certain weight, you must pay an additional fee? Yep, the heavier your luggage is, the more you have to pay. Doesn’t seem fair, but that’s the way it works. Some airlines are even charging for you to check one suitcase! It’s absurd! But once you check your luggage, you think the hard part’s over? No, it gets harder as you continue to your destination. Those who only had carry-on items are already in line to get their rental car. Some may even be in the back of a taxi halfway to their destination and you are just beginning the process of finding the place you must go to claim your luggage. But just in case there’s any confusion, let’s get the term correct. It’s officially called “Baggage Claim”. Luggage has a more sophisticated ring to it, but baggage? It doesn’t sound so fun. So you trudge down the escalator. Further and further you go. And then you run into the others who are trying to figure this out too. Which carousel is your baggage on? There’s more than one to choose from. By the time you finally find correct carousel, a crowd has formed all the way around this tiny contraption that makes you dizzy just watching. And then the game begins. All the suitcases begin conveying down the belt. Many of these look alike. Most are the bold, dark color of black. Many are dusty brown. Some are grey. You might even see an occasional bright pink or neon yellow. Some have fancy tags on them to distinguish them from the others. You finally see a suitcase coming around the corner of the belt. That looks like mine! You quickly flip over the tag, making sure it’s yours. With a sigh of relief, you realize it is indeed yours. But now you must use both hands to haul it off the belt, being ever so careful not to knock over the gentleman standing next to you who’s still looking for his suitcase. Sometimes this process doesn’t go very quickly. You might be one of the lucky ones, whose suitcases come out first. But if not, you must wait. And wait some more. In rare cases you may not ever see your suitcase come out on the conveyor belt. You watch for the third time, but to no avail you don’t see yours. The conveyor belt turns off and you scratch your head in bewilderment. Where’s my baggage? An employee directs you to customer service where a sign hangs over the door in bold letters: Lost Baggage. You might get your luggage in a few hours. You might get it in a few days. You might even wonder if you’ll get it at all. Ever attempted to pull a heavy suitcase behind you? In addition to the backpack already weighing down on your back. Or the cute purse hanging down from your shoulder. By the time you get to the rental car line, your arms are aching. Your back feels numb from pulling the added weight. You look around the corner and see others with one small bag zipping past at a fast pace. How did they do that? Why didn’t we pack lighter? Wish I didn’t have all this stuff! Dear friends, have you ever given thought to the fact that our lives are very much like travelers in a busy airport? Whether you can count on one hand the times you’ve flown or you have so many frequent flyer miles you’ve lost count. 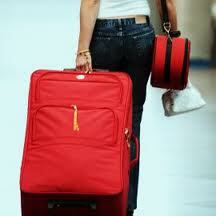 We are all travelers and we can choose what to do with our luggage. We can be like those who lug heavy suitcases. We will call this baggage. Yes, that is what it really is. You’ve heard it. Maybe you’ve even said it: She has so much baggage from her childhood. He has so much baggage from his first marriage, he’ll never remarry. Maybe you are the one with the baggage and you’re not sure what to do with it. We could choose to travel lighter and bypass the check-in station. But sometimes we heave our baggage on our backs and think we are stuck with this ever-increasing load. Just like some travelers have to pay an extra fee if they go over the limit, we often pay a hefty price for the baggage we carry. I’ll never forgive her for what she did to me. I’ll never get over what happened to me as a child. I’ll always feel shame for what I did back then. The price we pay is way more than an extra fifty bucks. The price we pay looks different but it’s never worth it: Bitterness.Unforgiveness. Shame. Unworthiness. These things hold us back from God’s blessings. This baggage holds us back from deeper relationships. This baggage holds us captive to the enemy. This baggage builds up walls around us. It weighs us down and we feel weary. We feel tired. We feel absolutely overwhelmed. No matter what color, shape or size, it is still baggage. We might even put a fancy tag on it and call it something else. But it is still baggage. We might even recognize our baggage at times: Yep, there’s mine. Hey, my baggage is coming around the corner. Get out of my way or I might just knock you over in an attempt to grab a hold of it. Yes, we often hurt others in an attempt to hang onto our baggage. We knock them right out of the way at all costs. You might recognize your baggage or sadly you could be one of the one’s who never see your baggage on the conveyor belt of life. It might be bouncing around out there somewhere. It may be in the lost and found. It may have even lost its tag. But it’s still yours. Whether you claim it or not. It will still weigh you down. Dear friend, you do not have to choose to travel through this life with huge baggage weighing you down. You see, someone has already paid your fee. He has not only paid the price, but he is carrying the heavy load for you. Give your past baggage to Him at the check-in station and run on up ahead to the gate to catch your next flight. He wants you to travel light! Only take what you need. It sure does make for an easier journey. Let go of the bitterness towards that person who hurt you. Let go of the childhood dysfunction. Let go of the shameful things you’ve held onto. Let go of the unrealistic expectations. If you grab tightly to these things, you won’t have to feel weighed down with the extra baggage. You can walk without something else pulling on you. You can walk freely and enjoy the journey. He has claimed your baggage. He has journeyed down the escalator for us and paid the ultimate price for us. The baggage that once felt so heavy. So hurtful. Painful. Weary. Fearful. He paid for all of it. He promises us in His word that His yoke is easy; His burden is light.I encourage you today to travel with just your carry on! Leave the baggage and enjoy your journey. Enjoy the peace that only God can give. ← Are You on Empty?